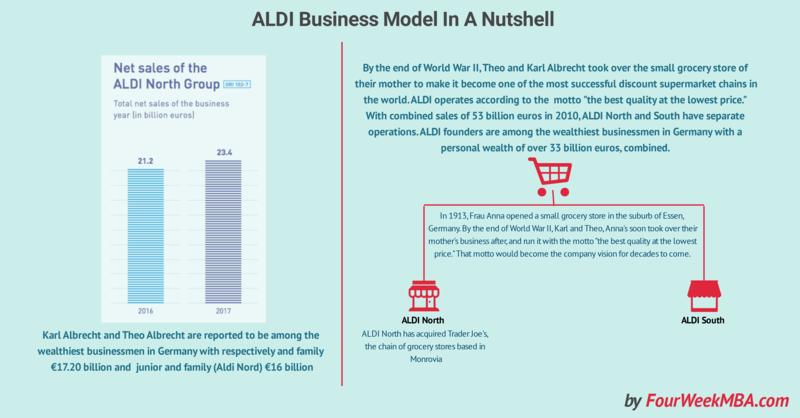 By the end of World War II, Theo and Karl Albrecht took over the small grocery store of their mother to make it become one of the most successful discount supermarket chains in the world. ALDI operates according to the motto “the best quality at the lowest price.” With combined sales of 53 billion euros in 2010, ALDI North and South have separate operations. ALDI founders are among the wealthiest businessmen in Germany with a personal wealth of over 33 billion euros, combined. How does Aldi keep its prices low? In 1913, Frau Anna opened a small grocery store in the suburb of Essen, Germany. By the end of World War II, Karl and Theo, Anna’s soon took over their mother’s business after, and run it with the motto “the best quality at the lowest price.” That motto would become the company vision for decades to come. By 1948, opening the two brothers had opened four stores in the local area. They managed to keep prices extremely low by only stocking non-perishable items and by selecting the things that were selling the most from the shelves while removing the slow-sellers. By that time Theo and Karl Albrecht decided focused on developing a chain of small stores. In 1954, the brothers opened Germany’s first self-service store. By 1960, Theo and Karl Albrecht owned 300 stores with an annual turnover of millions of dollars. In the 1950s the brothers split the chain into two separate groups, presumably over a dispute about whether to sell cigarettes. Theo headed Albrecht-Diskont Nord, which sold cigarette. Karl instead became the CEO of Albrecht-Diskont Süd, which did not sell cigarettes. In 1962, despite the disagreement kept working together and changed the name of the. group to Aldi Nord and Aldi Süd. The taken from the first two letters of Albrecht and Diskont. The two businesses became financially and legally separate in 1966. By this time, there were 200 Aldi Süd stores in Germany. In 1979, a trust headed by Aldi Nord’s Theo Albrecht bought the chain Trader Joe’s, which now operates 475 stores in the US. The ALDI North Group is represented in nine European countries with companies as independent legal entities. In Germany, the ALDI North Group as a group of subsidiaries is comprised of legally independent regional companies, in each case with the legal form of a GmbH & Co. KG, which means that the managing directors of the independent regional companies have equal status in casting votes at regular board meetings. ALDI Einkauf GmbH & Co. oHG is engaged by these regional companies to provide various services. This company is also the licensor of the ALDI brand for the legally independent foreign companies of the ALDI North Group operating in the ALDI North Group countries. This arrangement ensures a uniform market profile. In 2017 ALDI North Group recorded sales for 23.4 billion euros, compared to 21.2 billion in 2016. ALDI North has more than 69,000 employees. One of the secret for ALDI business model success is to keep its price low is the own brand’s portfolio, which as. you can see spans anywhere from the 73.6% in Poland, up to 96.1% in Belgium/Luxembourg. This makes the total personal wealth from ALDI founders at over 33 billion euros (about $38 billion at current rate). Aldi might well be among the largest private companies in the world. As a private company, ALDI has total control over its strategy without focusing on quarters results. Also, ALDI can keep its number relatively secret from its competition.